KUNSTHAUS WIEN better known as The Hundertwasser museum, has lent its works to the Marseille-based centre de la Vielle Charité for the retrospective “Hundertwasser – le rêve de la couleur”. This exhibition which takes place until the 9th September, shows 90 paintings, graphic works, tapestries and hand-knotted carpets of the famous Austrian artist, otherwise part of the permanent exhibiton in Vennese KUNSTHAUS WIEN. 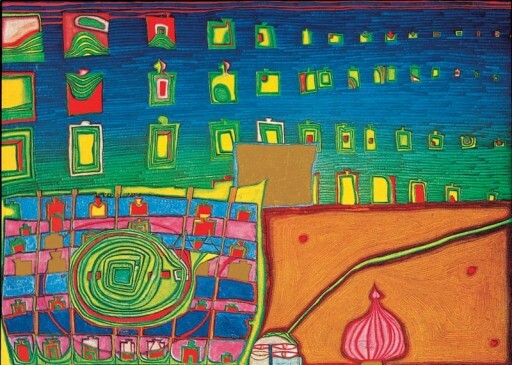 For the duration of the retrospective in Marseille, Hundertwasser Museum in Vienna has replaced the absent works made by loans from private collections and other Austrian museums. Among them is “Rain over China in flames” (1958) – a typical example of Hundertwasser’s “trans automatism” and one of his most important works which was given to the museum by a private collector on permanent loan with immediate effect. 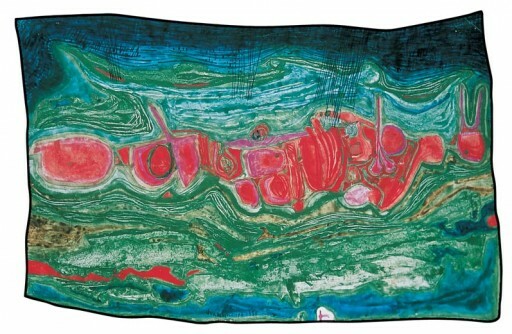 Two other outstanding Hundertwasser paintings from mid-1960’s, “The Walker” (also coming from a private collection) and “Homesickness” from the Essl Museum in Klosterneuburg, have never been exhibited in KUNSTHAUS WIEN before. Other loans in KUNSTHAUS WIEN are “Taranto invites and Expels Irina – The Cinema” (1969; Peter Infeld Private Foundation, Vienna) and “Red Lady with the mirrors of Mr. Neuffer” (1974; Eisenberger Collection, Vienna). All paintings, save “Rain over China…” will be returned to their owners after the finishing of Hundertwasser retrospective on the 9th September.